Image by Diana Containerships Inc.
Diana Containerships Inc. (NASDAQ: DCIX), (the “Company”), a global shipping company specializing in the ownership of containerships, today announced that, through a separate wholly-owned subsidiary, it has entered into a time charter contract with Hyundai Merchant Marine Co., Ltd., Seoul, for one of its Panamax container vessels, the m/v Pamina. The gross charter rate is US$11,950 per day, minus a 5% commission paid to third parties, for a period of minimum eight (8) months to maximum twelve (12) months. The charter will commence on August 24, 2018. 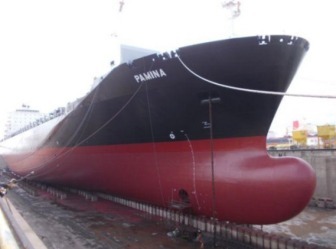 The m/v Pamina is currently chartered, as previously announced, to Orient Overseas Container Line Ltd., Hong Kong, at a gross charter rate of US$9,500 per day, minus a 3.75% commission paid to third parties.